This is among the simple and easy yet tasty recipes. 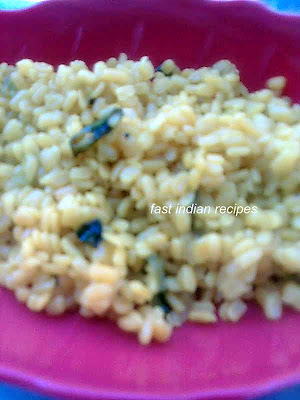 What is the moong dal used in this recipe? It is split yellow moong dal or split skinless green gram. Sookhi moong dal is also known as sookhi dal amritsari. You can have this dal as a breakfast option or with your parathas or rotis. 1. Wash moong dal, drain. Soak in water for 1/2 an hour. Drain. 2. Heat ghee in a pan and add cumin seeds. When they turn darker, add hing. 3. Add green chillies and sauté for 1 minute. 4. Add dal, 3/4 cup water, salt and turmeric powder. 5. Cook, stirring, moong dal till all water evaporates. Add more water if required, remembering that dal should not get mashed up. 6. Turn off the heat and mix in lemon juice. Garnish sookhi moong dal with coriander leaves. Thanks for the info. Uma. Glad u liked the recipe. Hi, In this modern age, people are hard pressed for time. It could be that because of time constraint, you resisted trying new recipes or maybe you found them too difficult to follow. Well, here is my solution for you. I will blog about recipes which are fast to make, easy and practical to follow. So, even if you are a beginner there are so many recipes you can try your hands at. In order to make my recipes healthy, i have reduced the quantity of fat. Also, to suit every palate, i have reduced the quantity of red chilli powder (cayenne pepper) in my recipes. You can increase these ingredients to suit your tastes. Just because my Indian recipes are easy and healthy, doesn't make them any less delicious. In fact you will be delighted at the end result. I dedicate this blog to my dear mother Mrs. Omwati Gupta who taught me basic cooking and who still hands me over so many of her recipes. I love you mom. I also owe a lot to dear husband Rahul Rungta who encouraged me to cook after marriage and gave me lot of cooking tips and advice as he is a wonderful cook himself.